Keeping food and drinks cold during a camping trip can be a challenge, especially in the summer here in Florida. Nobody likes ice melt inside the cooler turning hot dog buns to mush. Follow these preparation and packing tips, and you’ll enjoy cold food and beverages for an entire weekend or much longer. Choose your cooler. 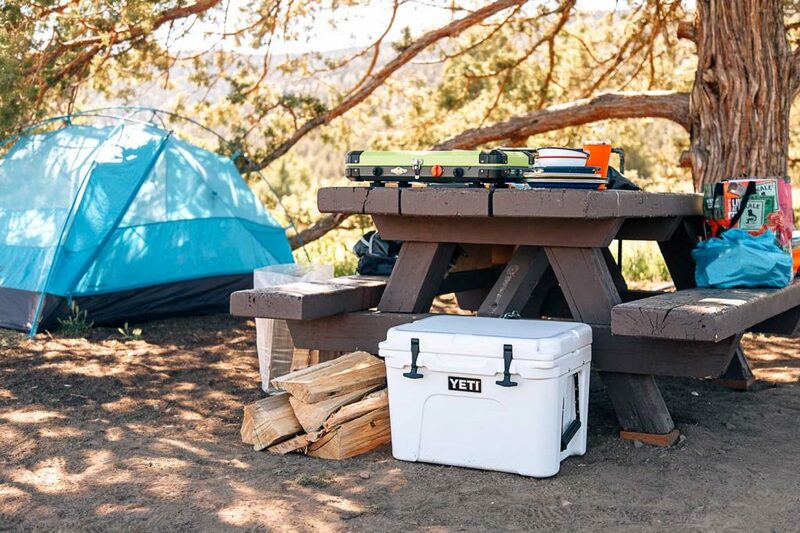 Without going into a review of cooler brands, just know that the newer, pricey rotomolded brands such as Yeti and Orion set the bar for insulation high. Your food and drink is likely to stay cold for multiple days without a big need for ice resupply. Your budget coolers usually have weak insulation in the lid area and require re-icing more frequently. Party planning. If you’re bringing a lot of beverages, your best bet might be using a two-cooler system. Use one cooler for beverages, and the other for food. The beverage cooler will be opened often, so the cold air will escape over and over. Consequently, the ice melts faster. And it’s OK to keep drinks cold in the ice melt. Allowing the food cooler to stay closed will keep the contents cold longer. Cool down your cooler. Avoid storing your cooler outside in the sun, in a hot garage or shed. If you do, bring it inside where it’s air-conditioned the night before you pack it. Better yet, sacrifice some ice to cool it down. If you have a large freezer, put your cooler in there overnight. Prep your food. Many items from the grocery store come in wasteful packaging. When possible, prepare your food as much as possible at home (chop up the vegetables) and repackage in zip-top freezer bags, which take up less room. If you’re bringing hamburger, steaks and such, freeze them. They will contribute to the cold inside the cooler, but be pulled out to thaw just before they are needed. Use freezer bags to keep things dry, such as those hot dog and hamburger buns. Choose your ice. Ice cubes are great for filing in gaps, but they melt faster. Try this instead: Freeze water into blocks using large Tupperware bins. Or dump out about a fourth of a gallon jug of water. Then freeze it. As the jug thaws, you’ll have cold water to drink. Win, win. You can do the same thing with bottles of water. You need to take some water out as the water will expand as it freezes. Freezer packs and dry ice are good options as well. Blocks at the bottom. Take your freezer packs or ice blocks and line the bottom of the cooler. Now they aren’t in the way. Now pack the final day’s food down low, working your way to the top with the items that will be consumed first. Fill in the gaps. Use ice cubes to fill in the gaps. You won’t need much if you pack the food it tightly. Remember, too much air inside is the enemy. If there is extra space, try putting a towel over the top of the food before closing the lid to reduce the empty space and confine the chill. Organize. To reduce the amount of time the lid is open, organize your food inside the cooler to reduce rummaging. Breakfast items on one side, dinners on the other. Last thing in. When packing the car, put the cooler in last. Stay cool. Keep the cooler under a table, under a tree, in the shade. Keep it closed. Pretty obvious. Keep the lid closed as much as possible throughout the trip. To drain or not to drain. On short trips, like a weekend, it’s good to keep the ice melt water in the cooler to prolong the chill. However, the water will speed up the thawing of any other ice, so on longer trips it may be better to drain the water occasionally.